How many HORSES to graze per acre of pasture land? Pasture - How many horses to graze per acre of land? Weather conditions and the time of year. How well the pasture has been managed in the past. Whether the horses are turned out 24 hours a day. How settled the group of horses is - a well settled group won’t churn the ground up as much as an unsettled one that gallop around or fight. The general rule is to allow at least one and a half acres of grazing for the first horse and one acre for each horse or pony after that. 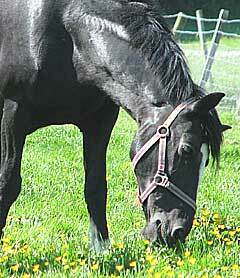 Provision also needs to be made for every part of the pasture to be rested for at least six weeks, twice a year. Some owners will try to keep horses on less acreage per horse, but, for example even having seven horses on 7 acres would stretch a field's resources to its limits. With careful grass management, it would technically be possible to cope but it would only take an average wet winter to leave you with a field which is so over-grazed and muddy that it would be of little use for turning out any horses or ponies. Once pasture has deteriorated, and becomes worthless for grazing, it is a long, hard process to return it to a good condition for grazing your horse or pony on. This might even mean re-seeding the grass, which would put the whole seven acres of pasture out of action for the best part of a year - leaving you without any grass for grazing for your horse or pony. the grass down to a length of 8 - 15 centimeters (6 inches) to stop rough areas appearing . Roll and chain harrow the pasture to level and aerate the soil. Fertilise the whole pasture each spring - remove the horses for a week until the fertiliser has thoroughly soaked into the ground. Rest each section of the field regularly. A local farmer or agricultural contractor will be able to do these tasks for you. It may also be worth contacting an agricultural consultant to visit and give you specific advice in relation to the soil type, drainage, fertilising etc.